Well, maybe a black and white theme doesn’t scream Spring…but that’s the wording on the image from Magenta. This is for the Sketch Challenge over at Splitcoast today. An interesting layout that lends itself to so many different designs. And, a great way to use up the scraps in your scrap drawer. You know…that pile that just keeps growing and growing as you reach for different colors to work with! The cardbase is Gina K. Luxury heavyweight in a standard A2 size. Next comes a layer of SU Basic Black, followed by three different size pieces of SU Neutrals Patterns Designer Series Paper Stack. 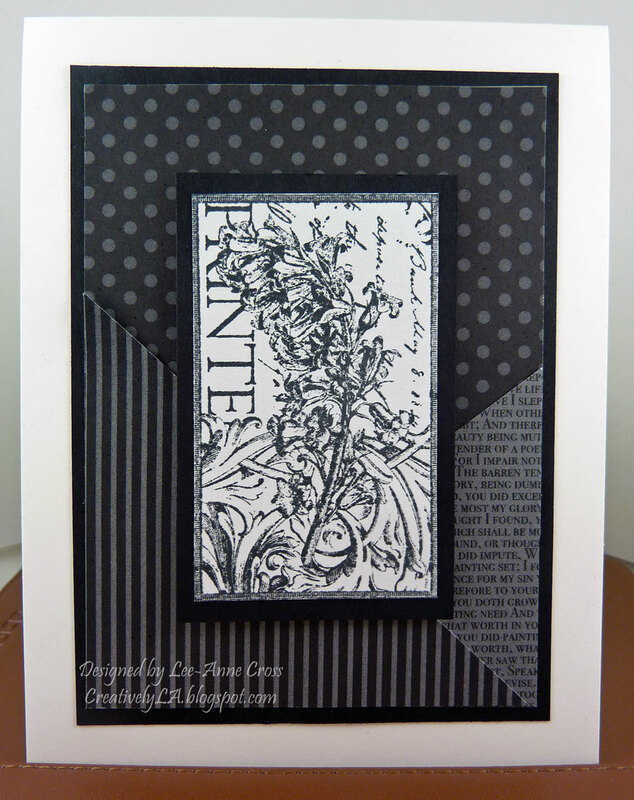 Then finally, the image panel that’s been stamped in Memento Tuxedo Black and layered on another piece of Basic Black. The image panel has been raised with dimensionals. This is just gorgeous….where is that image from? I love that sketch—it looked a bit daunting to me, but you've made it look quite elegant!